Albert H. Capanna, M.D., Joseph LaMancusa, Jr., M.D., Franco Erculei, M.D., Professor Kazem Fathie, M.D., Peter Christenson, M.D., and David A. Mulkey, M.D. ThAcquired immune deficiency syndrome (AIDS) is a disease initially described in 1981 (1). AIDS is characterized by defects in the immune system of an individual who is infected with the human immunodeficiency virus (HIV). Clinically, AIDS patients frequently present initially with Kaposi’s sarcoma, Pneumocystis carinii pneumonia, cytomegalovirus infection, and other opportunistic infections. The causative virus is transmitted through sexual activity, exposure to infected body fluids, and blood transfusions. The disease has been seen most frequently in homosexual men, intravenous drug users, Hai- tians, and hemophiliacs. HIV, a retrovirus, selectively infects and destroys T4 lymphocytes, leading to an apparently per- manent immunodeficiency. Neurological symptoms are present in 39% of all AIDS patients; in one-third of these, nervous system involvement is responsible for the chief complaint (8). The first case of primary brain lymphoma in an AIDS patient was described in 1983 (12). There have been a total of 17 reported cases confirmed by brain biopsy and/or postmortem findings (6, 7, 9-13). Sufficient information is available from 10 of these cases to allow important findings to be summarized. Case I A 46-year-old, homosexual man was admitted to University Medical Center in Las Vegas, Nevada, on February 11, 1986, with a 3-week history of generalized seizures of recent onset, decreased level of consciousness, and complaints of slurred speech and dizziness. He was taking phenytoin, 100 mg 3 times daily. He had had oral thrush for the preceding 7 months, an unspecified parasitic infection in May 1985, hep- atitis in June 1985, and syphilis in 1962. Physical examination on admission revealed bilateral an- terior and posterior cervical adenopathy. The vital signs, including temperature, were normal. Examination of the heart, lungs, abdomen, and nervous system were within nor- mal limits. Laboratory studies on admission were significant for a depressed white blood cell count of 2.3 x 10′ (normal, 4-12 x 109). The electrolytes, hemoglobin and platelet counts, liver function, and kidney function were within normal limits. The phenytoin level was within the therapeutic range. A chest x-ray film was normal. 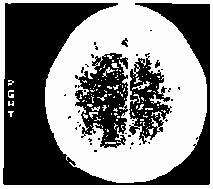 On admission, computed tomography (CT) showed a 3.2- cm enhancing ring in the right frontal lobe with two small enhancing satellite rings and mild edema. There was no midline shift, and the findings were interpreted as being most compatible with cerebral abscess. The patient was placed on intravenous antibiotics and followed with weekly CT, which showed no significant change (Figs. I and 2). Angiography was consistent with an inflam- matory process involving the right frontal lobe. Further lab- oratory investigation revealed a T cell helper/suppressor ratio of 0.3 (normal, I to 3) and antibodies to HIV. On February 28, 1986, the patient underwent a right fron- toparietal craniotomy for excision of the lesions. The histo- logical diagnosis was immunoblastic malignant lymphoma (Fig. 3). Postoperatively, the patient did well, was started on radiotherapy, and was discharged on March 3, 1986. Case 2 A 32-year-old, homosexual man, whose sexual partner is patient 1, was admitted to the University Medical Center of Southern Nevada on March 4, 1986, with complaints of a 3-month history of intermittent fever, night chills, and malaise that had not improved with outpatient treatment. He had a 3-month history of an ataxic gait and increasing difficulty with writing. He was taking Bactrim DS (sulfamethoxazole- trimethoprim; Roche Laboratories, Nutley, New Jersey), one tablet twice daily. His medical history included hepatitis in 1980, glomen@do- nephritis in 1972, and rheumatic fever in 1960. The patient had normal vital signs. Neurological examina- tion revealed left dysmetria, a mildly ataxic gait, and a positive Romberg’s sign. Cranial nerve function, the deep tendon reflexes, sensation, and motor strength were within normal limits. Examinations of the heart, lungs, abdomen, and ex- tremities were essentially unremarkable. Abnormal laboratory studies consisted of a low platelet count (79 x 10’/Iitre; normal, 150 to 375), HIV antibody positivity, and cytomeg- alovirus titer of 1:6400. A chest x-ray film was normal. CT on admission demonstrated a high, right parietal lesion (Fig. 4), consistent with an abscess or region of cerebritis, and the patient was placed on antibiotics. A magnetic resonance imag@ng (MRI) examination clearly delineated the extent of the lesion (Figs. 5 and 6). On March 15, 1986, a right pariew craniotomy was per- formed. The pathological diagnosis was immunoblastic lym- phoma, with a pattern similar to that in Case 1. In both cases, the cells reacted to antibodies to panlymphoid antigen and were negative for glial fibriuary acidic protein, confirming their lymphoid origin (Fig. 7). Postoperatively, the patient did well and was started on radiation therapy. He was discharged on March 21, 1986.
fig. 1. Case 1. Aright frontal lobe, enhanced 3.2-cm lesion with a contrast-enhanced margin is surrounded by low density, white matter edema. The initial CT appearance is nonspecific, compatible with either cortical abscess or tumor. fig. 2. Case 1. Sixteen days later, enhanced CT shows three lesions. The small, intervenin lesion may have developed or may have been below the level of the previous scans. The edema is unchanged. Lack of response to antibiotics prompted a request for surgical biopsy. fig. 3. Case 1. Malignant lymphoma. A, small cerebral blood vessels show perivasculr infiltration of lymphocytes (x10). 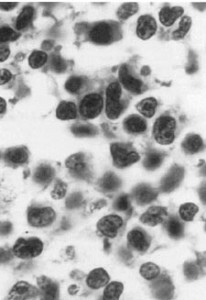 B, large lymphocytess with prominent nucleoli are characteristic of immunoblasts(x40). fig 4. Case 2: On enhanced CT, a small image, the region of low density with margin enhancement is present in the upper, parasagital, right parietal cortex. This was originally interpreted as a zone of cerebritis or possibly subacute ischemic infarction. fig. 5. Case 2: On MRI, T2-weighted lesion shows high signal intensity. fig 6. Case 2: On a coronal-oriented MRI scan, a T2-weighted image confirms the parasagittal, right parietal location of the high signal intensity lesion extending deep into the adjacent parietal white matter. The curvilinear line of high intensity in the left parietal area is cerebrospinal fluid in a posterior parietal sulcus. The somewhat rectangular, high intensity region below it is the posterior end of the left occipital horn. fig. 7. Case 2: The cleared nuclear chromatin and prominent nucleoli are typical of activated or transformed lymphocytes, or immunoblasts(x40). 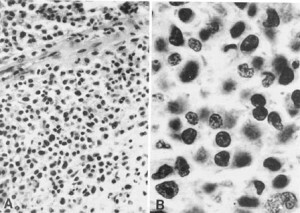 These two cases are unique among the reported cases of primary central nervous system (CNS) lymphoma in patients with AIDS: (a) primary CNS lymphoma has never been documented in sexual partners with AIDS, (b) the diagnosis of primary CNS lymphoma has not included MRI data, and (c) primary CNS lymphoma in patients with AIDS has not been treated with both open surgical excision and radiation therapy. Approximately 2% of all malignant lymphomas are confined to the CNS (3). ). Non-Hodgkin’s lymphomas account for 3% of all tumors in the general population (4). The patient with AIDS apparently has a significantly increased chance of developing non-Hodgkin’s lymphoma. Already there are reports in the literature of 17 cases of primary CNS lymphoma in these immunocompromised patients. The reasons for this increased incidence is unknown, but several hypotheses have been promulgated in the literature (4, 5, 14). Our report of two sexual partners with CNS lymphoma suggests a transmittable causative factor. Abnormal CT is present in 27% of patients with AIDS who develop neurological symptoms (2). The most common abnormalities are toxoplasmosis, progressive multifocal leukoencephalopathy, lymphoma, and hemorrhage. In many in- stances, the CT findings are nonspecific and tissue biopsy is necessary for definitive diagnosis. On CT examination, lymphomas often demonstrate meningeal enhancement and nodular or ring-enhancing lesions in the deep, periventricular white matter and may well be confused with an infectious process (2). There is little reported experience using MRI for the diagnosis of primary CNS lymphomas, and its utility as the primary diagnostic tool is unknown. Comparison of the CT and MRI in our second patient, however, suggests that MRI may be more sensitive. Of the primary CNS lymphomas reported in AIDS patients, 50% are of the immunoblastic type. Radiation has been the treatment of choice for primary CNS lymphoma in patients both with and without AIDS. The average survival after radiation treatment in non-AIDS patients is 15.2 months (3), whereas the longest survival in an AIDS patient was 9 months. The survival after both operation and radiation is not known for the AIDS group. In both of our cases, radiation treatment followed surgical excision. Even though AIDS is ultimately fatal, it is hoped that combined therapy may prolong the survival of AIDS patients with cerebral lymphoma. CNS lesions in patients with AIDS are diverse, and our two cases underscore the need for precise histopathological diagnosis in each case to ensure institution of the most appropriate treatment. We thank Dawn M. Capanna, R.N., B.S., Kathy Conrad, and Penni Gordhamer. 1. Centers for Disease Control: Revision of the case definition of acquired immunodeficiency syndrome for national reporting- United States. MMWR 34:373-375,1985. 2. Elldn CM, Leon E, Grenell SL, Leeds NE: Intracranial lesions in the acquired immunodeficiency syndrome. JAMA 253:393-396, 1985. 3. Henry JR, Hefner RR, Dillard SH, Earle KM, Davis RL: Primary malignant lymphomas of the central nervous system. Cancer 34:1293-1302, 1974. 4. Joachim HL, Cooper MC, Hellman CirC: Lymphomas in men at high risk for acquired immune deficiency syndrome (AIDS): A study of 21 cases. Cancer 56:2831-2842, 1985. 5. Kay HE: lmmunosuppression and the risk of lymphoma. N Engl J Med 308:1099-1100,1983 (letter). 6. Kelly WM, Brant-Zawadkki M: Acquired immunodeficiency syndrome: Neuroradiologic findings. Radiology 149:485-491, 1983. 7. Lehrick JR, Hedley-White ET, Harris NL: Acquired immuno- deficiency syndrome and cranial nerve abnormalities. N Engi J Med 309:359-369, 1983. 8. Levy RM, Bredesen DE, Rosenblum ML: Neurological manifes- tations of the acquired immunodeficiency syndrome (AIDS): Experience at UCSF and review of the literature. J Neurosurg 62:475-495, 1985. 9. Levy RM, Pons VG, Rosenblum ML: Central nervous system mass lesions in the acquired immunodeficiency syndrome (AIDS). J Neurosurg 61:9-16,1984. 10. Reyes CV: Primary malignant lymphonia of the brain in acquired immune deficiency syndrome. Acta Cytol (Baltimore) 29:85-86, 1985 (letter). 11. Shiach CR, Burt AD, Isles CG, Ball SG: Pyrexia of undetermined origin, diarrhea, and primary cerebral lymphoma associated with acquired immunodeficiency. Br Med J 288:449-450,1984. 12. Snider V,/D, Simpson DM, Dronyk KE: Primary lymphoma of the nervous system associated with acquired immune-deficiency syndrome. N Engi J Med 308:45,1983 (letter). 13. Whalen MA, Kricheff 11, Handler M, Ho V, Crystal K, Gopinathan G, Laubenstein L: Acquired immunodeficiency syndrome: Cerebral computed tomographic manifestations. Radiology 149:477-484, 1983. 14. Ziegler JL, Beckstead JA, Volberding PA, Abrams DI, Levine AM, Lukes RJ, Gill PS, Burkes RL, Meyer PR, Metroka CE, Mouradian J, Moore A, Riggs SA, Butler JJ, Cabanillas FC, Hersh E, Newell GR, Laubenstein LJ, Knowles D, Odajnyk C, Raphael B, Koziner B, Urmacher C, Clarkson BD: Non-Hodg- kin’s lymphoma in 90 homosexual men: Relation to generalized lymphadenopathy and the acquired immunodeficiency syndrome. N Engl J Med 311:565-570,1984. This is a very interesting report of two patients, both of whom have AIDS and who developed the fairly rare entity of primary brain lymphoma. It should serve to remind all of us who are asked to care for these patients that ring-enhancing lesions are not necessarily an infectious process and that the immune system does seem to play a role in the control of neoplastic disease. It also allows one to hypothesize that perhaps some, if not all, neoplastic disease is infectious in origin. As devastating as the AIDS epidemic is, medical science may yet learn a great deal about other disease processes as a result of the immunodeficiency caused by the HTLV-3 virus.